Some might call it a crossover, but the term softroader is probably a better fit for Citroen’s new C5 Aircross. Cushioned suspension and squishy seats were high on the list of design goals for the car, forming part of the French company’s Advanced Comfort strategy. If you’ve grown weary of being rattled about by sports suspension, rubber-band tyres, concrete springs and bucket seats, you might warm to a more welcoming, sofa-inspired alternative. Or so Citroen hopes. The chairs in the front row of the C5 Aircross were certainly a high point of my time in the car. They offer an inviting quilted look and a cosy, supportive feel that let me shrug off several hours behind the wheel. This result is achieved by a novel sandwich of differing types of foam within the seat’s core. While the rigours of crash testing mean we are unlikely to ever see a revival of the deep, squashy armchairs that were once a Citroen hallmark (because too soft a seat would let you slip out from under the seatbelt in an impact), it’s a pleasant change to see comfort given high priority. The rear seats haven’t been forgotten either, with their own blend of soft-feel foams and the ability to slide and recline a little as well. 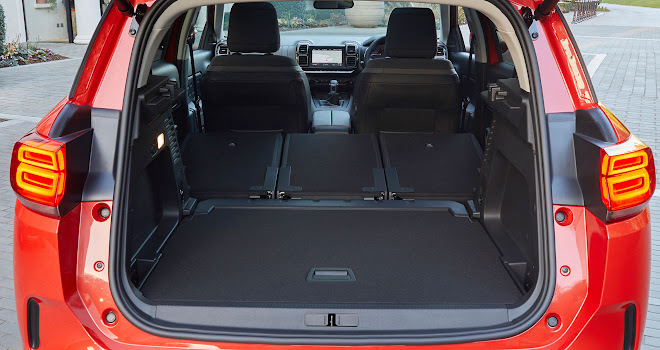 Indeed each of the three rear seats moves and folds individually – an attempt by Citroen to bring the flexibility of unfashionable MPVs to the more trendy sphere of SUVs. Note, however, that the middle rear seat is not equipped for Isofix child seats, unlike the equivalent item in the older C4 Picasso (or C4 SpaceTourer, as it’s now known), which can accommodate three kiddies in a row. I did spot Isofix markings on the front passenger seat of the C5 Aircross, however. 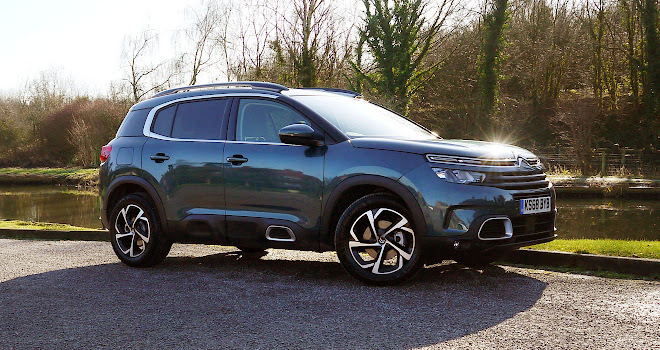 Citroen’s other big comfort innovation – suspension with “Progressive Hydraulic Cushions” – is fitted across the range and works well, up to a point. It adds extra damping and springs to the car’s struts, allowing a softer response to modest bumps without the usual drawback of whale-like wallowing over bigger craters. 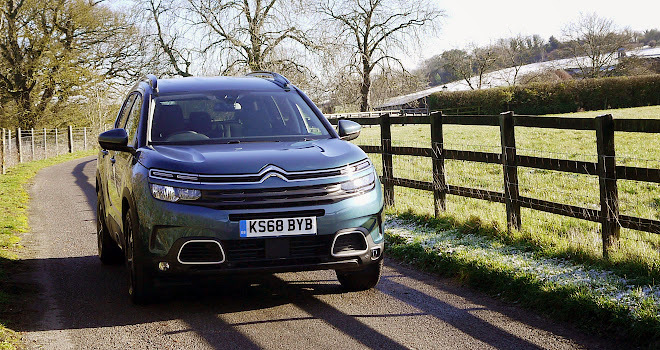 If you’re expecting a magic-carpet glide over everything that the Great British highway can throw at a car you’ll be sadly disappointed, because the C5 Aircross will still thump and bump when the going gets really rough. But I felt the car didn’t jiggle and wiggle as much as I might normally expect most of the rest of the time, with cracks, transverse ridges, manhole covers and motorway expansion joints all smoothed over remarkably well. In kerb-appeal terms, the French design team has done a smart job applying Citroen’s warm and friendly design cues across the new car. 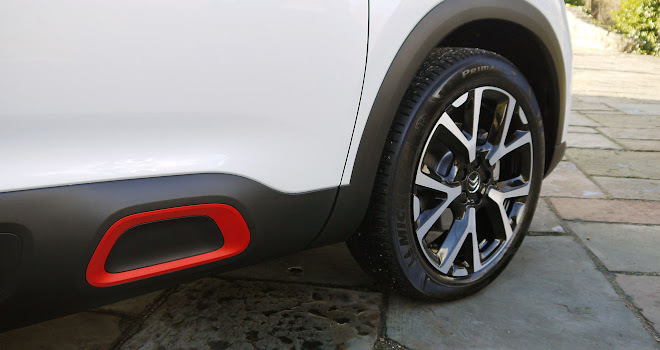 The slightly bulbous surfaces of the smaller C3 Aircross have been tautened up for this larger softroader, and the wider style of the front grille gives the C5 Aircross a more assertive expression. A big C-shaped curve of chrome is a highlight of the side view, separating the bigger roll-down windows from the dinky glass panel in the rear pillar. The roof can be ordered in either body colour or black, and with the option of a tilt-and-slide panoramic glass panel. 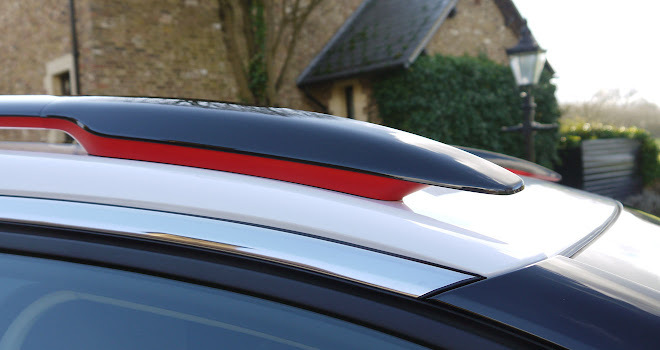 It’s also possible to option eye-catching splashes of colour in the lower bumpers, side cladding and the underside of the roof rails. Behind the wheel, one of the most noticeable features is the height of the broad centre console, which runs straight forward from the twin armrests without much of a dip. 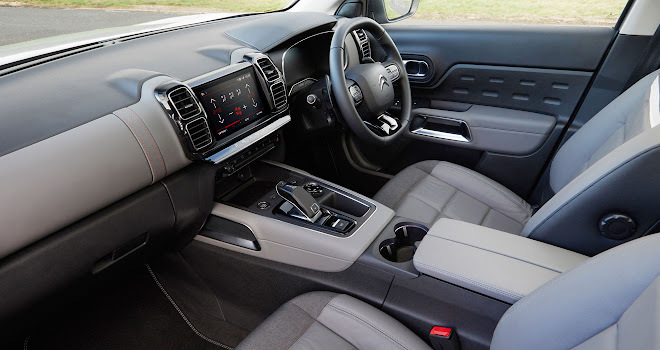 On the plus side, this gives a nicely ensconced feeling for the front seat occupants, as well as creating a massive storage space beneath the flip-up armrests. On the downside, it dictates the angle of your gear-changing arm in manual-transmission cars. I didn’t find it uncomfortable, but people who prefer to flip a central armrest out of the way to free up their elbow won’t have that option in the C5 Aircross. 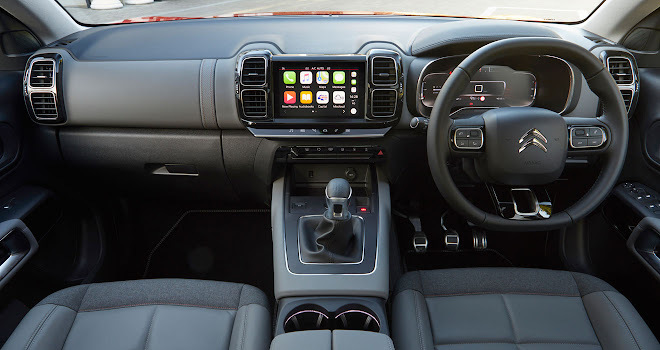 The interior also offers up an eight-inch central touchscreen and 12-inch digital instrument cluster. Heating and ventilation controls are entirely on-screen, which seems to be an increasingly common design these days. Switching between the main screen options is done via a row of immobile touch-sensitive keys printed on a slender strip of piano-black plastic, which means you do have to look at what you’re doing. It’s not feasible to change the temperature without taking your eyes off the road, for example. The bright and colourful digital instrument cluster offers a variety of different configurations that seem generally well designed, if a little over the top in some of the graphical flourishes, especially when transitioning from one layout to another. I did particularly welcome a Saab-like “Minimum” option that blackened most of the cluster, with only essential data presented neatly in the centre. It should prove perfect for long-distance night driving. The major controls are evenly weighted and offer smooth actions, but I didn’t detect the faintest whiff of feedback from the steering wheel or brake pedal. Interestingly, Citroen has elected to give the wheel a flat top as well as a flat bottom, creating a strange, squarish rim that passes lumpily through your fingers. Size-wise the C5 Aircross is marginally bigger than a Volkswagen Tiguan, or about half way between a Nissan Qashqai and a Skoda Kodiaq. 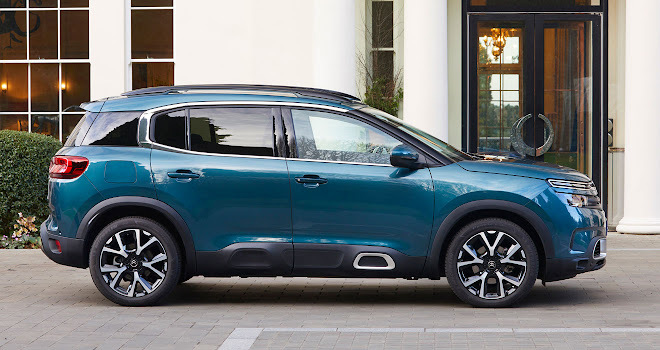 The French car is strictly a five-seat car, with no seven-seat option likely in the future without a significant bodywork stretch, in the manner of the Tiguan Allspace. Citroen says it has no plans for such things at the moment. 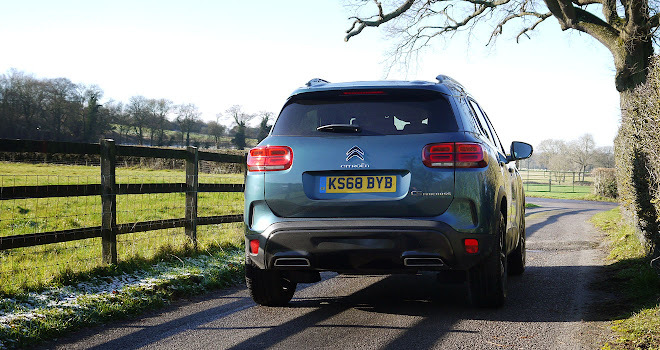 The new Citroen’s 4.5-metre length does provide a very capacious boot, however – adjustable from 580 to 720 litres by sliding the three rear seats backwards and forwards, or 1,630 litres with all three seats flopped. A space-saver spare wheel is included below the boot floor. The cabin remains relatively quiet, helped by laminated glass in the front windows, though engine noise does tend to make itself heard. I sampled the PureTech 130 Stop&Start petrol engine – a three-cylinder turbocharged unit that provides up to 129 hosepower and 230Nm of torque, paired with a six-speed manual gearbox. It makes an eager, warbling noise that can feel a little at odds with the generally serene feel of the C5 Aircross. The stop-start function did operate in a particularly smooth and seamless manner, however, which is a welcome bonus. I also drove a diesel-powered BlueHDi 130 version with a smooth-shifting eight-speed automatic transmission. The gearbox can be set to Normal, Eco or Sport settings via push-buttons on the centre console, or supervised via paddles behind the wheel. The petrol version I tried comes with a CO2 rating of 119 to 121g/km, according to options, while the diesel is rated at 106 to 108g/km. 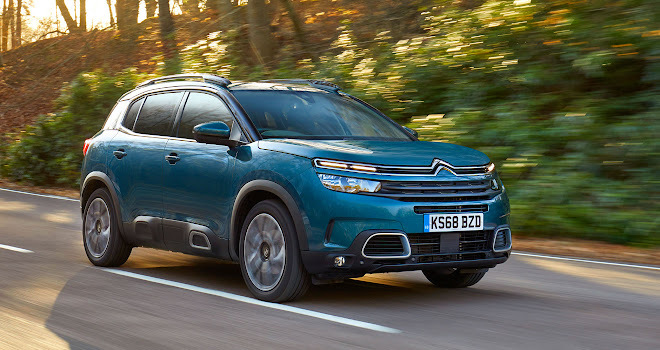 In 2020, Citroen says it will offer a plug-in hybrid edition of the C5 Aircross, with combined petrol and electric power, that it predicts will achieve a rating below 50g/km. Prices currently start at £23,225 for a manual petrol car in entry-level Feel trim, rising to £32,725 for the most powerful diesel automatic in the top Flair Plus trim.